EQYB is one Magnetic drive and Vortex pump application for Gas-Liquid Mixture, the pump is basing on many years experience of the company produce Vortex Pump and improved the design. The pump adopts magnetic transmission structure, non shaft sealing, to ensure the pump no leakage when transporting liquids containing gas , after the company’s R &D team combined with the Scientific research personnel in Colleges and Universities to developed the new model that can No load, dry grinding, high temperature resistance, energy saving and environmental protection, to turn over a new page of the history that Magnetic drive pump can’t runing non-load. 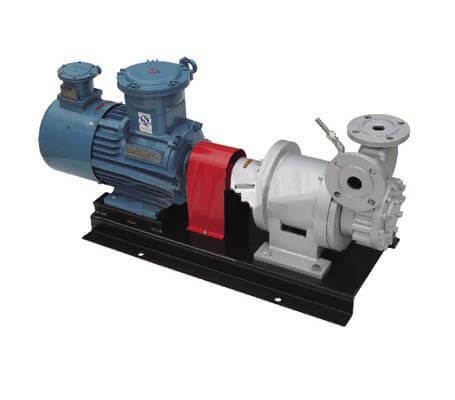 after application of Through use of a number of customers proved that the pump not only has the characteristics of small capacity with high head, but also has the advantage of magnetic driven pump without leakage, therefore it is favored by many end users. the Pump wet parts are stainless steel or other metal materials, can be non-leakage to transport flammable, explosive, poison and other dangerous liquids, precious liquids, refrigerants or high-temperature liquids, low-viscosity liquids, corrosive liquids and harsh operation and liquid containing gases, liquid gas, liquid ammonia and other easy to gasification liquid transmission. In addition, compared with the canned pump, canned pump beside to the realization of our special functions, in small capacity application we have a very special advantage. Many customer feedback, to use of our EQYB magnetic driven pump to solve for their difficult that previous canned pump can’t for of high head with small capacity. by the other hand with a smaller power and energy saving, simple and convenient operation and maintenance, occupy smaller space, long service life, greatly reducing the operating costs. it can be fully replaceable for small capacity’s canned pump applications.